The Working Families Party and The Nation want you to vote for the corrupt, spiteful, untrustworthy Andrew Cuomo. Here’s why I just can’t. I am not someone beguiled by the narcissism of protest votes. I mostly see elections as revealingly bad theater and an opportunity to nerd out on data interactives. But once in front of a ballot, I’m a fairly uncomplicated and pragmatic voter. I went for Kerry and Obama because they were obviously better than Bush, McCain and Romney. In New York State, I vote the Working Families Party line because under fusion voting, I can cast a ballot for a party that aspires to push the political system leftward without risking helping a Republican get elected. But this time around, I just can’t. This magazine has endorsed Andrew Cuomo on the WFP line in order to strengthen the WFP’s hand and to keep it on the ballot going forward. I respect the thinking that went into this decision, but I don’t agree with it. On November 4, I’m voting for Howie Hawkins on the Green Party ticket—and I hope you do too. Let’s get a couple things out of the way. First, Howie Hawkins sounds like a nice guy, and his platform is admirable in many ways. He supports universal healthcare, raising the minimum wage, banning fracking, creating green jobs and serious ethics reform. His education agenda calls for full funding of public schools, universal pre-K and free tuition at state higher-ed institutions, earning him the endorsement of several dissident teachers unions, as well as education activist Diane Ravitch. But neither he nor the Green Party, with just a handful of elected officials anywhere in New York, will emerge from this election as a significant left-bearing force in state politics. A vote for him is, in fact, a protest vote and little more. Second, Cuomo leads Republican Rob Astorino by more than twenty points in polls and is in no danger of losing. In terms of governing consequences, this is the safest of elections in which to cast a protest vote. The decision then is about the WFP, its relationship to Cuomo and its future under what promises to be another four years of his governorship. At the crux of the issue is the deal struck between the WFP leadership and Cuomo at the party’s convention back in June. In exchange for endorsing him over Fordham law professor and activist Zephyr Teachout, Cuomo promised to campaign for Senate Democrats (yes, you read that correctly) and to pass public financing of elections (a potential game-changer), a ten-point “Women’s Equality Agenda,” marijuana decriminalization, a raise in the state minimum wage, greater municipal control over the minimum wage and more funding for public schools (see Sarah Jaffe, Jarrett Murphy and Ted Fertik on the deal). The machinations and compromises leading up to the deal are byzantine, but in a nutshell: the WFP’s unions (1199, HTC, 32BJ, etc. ), which provide much of the party’s funding, supported the deal—in part because Cuomo threatened and mollified them in the lead-up to the convention and in part because, as institutions, they are dispositionally inclined to prefer negotiations over third-party challenges. Meanwhile, the party’s activists wanted to roll the dice on Teachout and confront Cuomo and the state Democratic Party directly. After a heated debate, some heckling and a lot of good faith arguments, the pro-Cuomo faction, rallied by NYC mayor Bill de Blasio, won—58.7 percent to 41.3 percent. At the time, many reasonable progressives defended the deal as a necessary, and even optimal, example of transactional politics. Hindsight is 20/20, but events since have proven that analysis to be misjudged. The ferment against Cuomo is much deeper and wider than anticipated. Teachout went on to challenge Cuomo in the Democratic primary, and with almost no funding, time or campaign apparatus, she won 34 percent of the vote and half the counties in the state (Teachout has since refused to endorse Cuomo in the general election). The liberal-centrist New York Times published a devastating piece on Cuomo’s corruption of his own ethics commission, and then declined to endorse him in the primary. 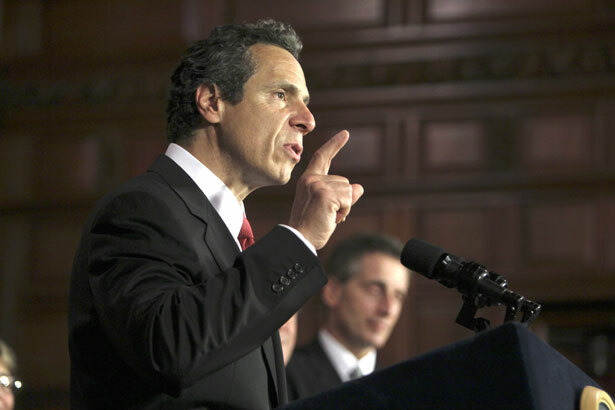 A federal investigation of Cuomo’s role in the Moreland Commission still looms. If ever there was a moment to gamble on the outside part of inside/outside strategy, the Teachout/WFP challenge was the one. I won’t go so far as to say that Teachout could have won, but a full campaign would have created more leverage points against Cuomo and forced him into the debates and public appearances he loathes while also building the WFP’s grassroots base, putting it in a much stronger position than it could ever hope to be in now. I normally despise it when left critics use the term Stockholm Syndrome to describe progressives’ relationship to centrist Democrats, but—hello, Stockholm Syndrome! Having missed a potentially transformational moment, the WFP is now handcuffed to a governor who has only proven to be untrustworthy, who connives to destroy the party at every turn and over whom the WFP has no demonstrable bargaining power to pressure him into keeping his promises. I would be genuinely sad if the WFP lost its ballot line. And I’m under no illusion that a vote for Hawkins builds the kind of power base that the WFP could be. As I acknowledged, my vote for Hawkins is a protest vote, against Cuomo, yes, but also against what the WFP has become—a party too dominated by inside institutional players who can’t or won’t see when the air is really better on the outside.